The CSB (in)courage Devotional Bible is an invitation for all women to find their stories within the tapestry of the greatest Story ever told — God's Story of Redemption. Featuring devotions by over one hundred writers of the (in)courage community, the CSB (in)courage Devotional Bible provides resources for women to explore the Bible, dive deep into Scripture, record their own stories, and find themselves among friends. Readers will experience Scripture in new ways in the company of women willing to "go first" with everyday stories that bear witness to God's grace to find beauty in brokenness and hope in the hard. (in)courage is a vibrant online community, reaching thousands of women every day, welcoming them just the way they are, offering a space to breathe, loving support, and resources for meaningful connection. 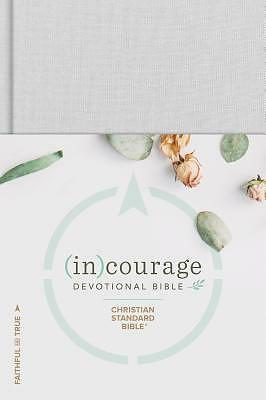 CSB (in)courage Devotional Bible by CSB Bibles by Holman was published by Holman Bible Publishers in October 2018 and is our 3242nd best seller. The ISBN for CSB (in)courage Devotional Bible is 9781462785032. Be the first to review CSB (in)courage Devotional Bible! Got a question? No problem! Just click here to ask us about CSB (in)courage Devotional Bible.